This was another excellent gathering, held at Tockington Village Hall and including our AGM. 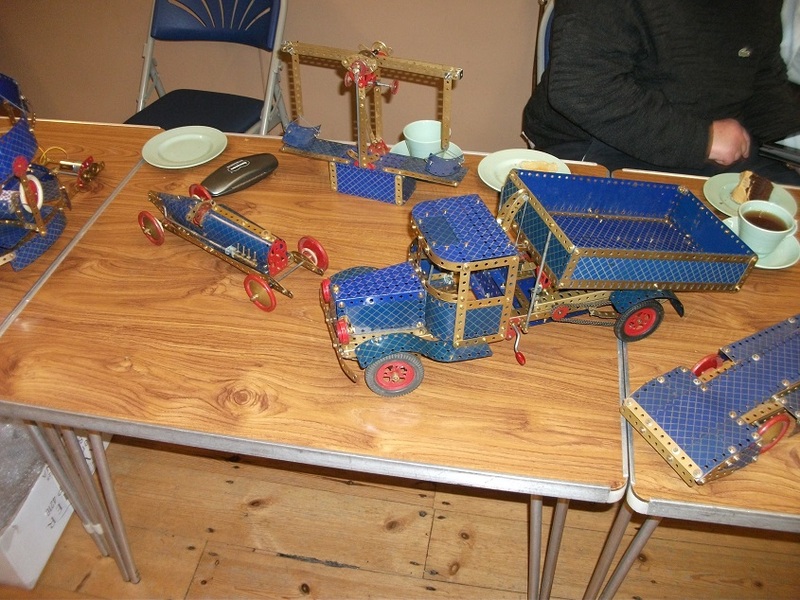 We had around twenty members present and a very successful sale of Meccano, most of which had been donated to the club. Club Chairman Neil Bedford brought along his current work in progress – an American Army vehicle known as the ‘Gama Goat’. This one hails from the Vietnam era and featured six wheel drive, four wheel steering and an articulated joint between the two body sections. The finished model will feature ‘ash-tray tyres’ and radio control. 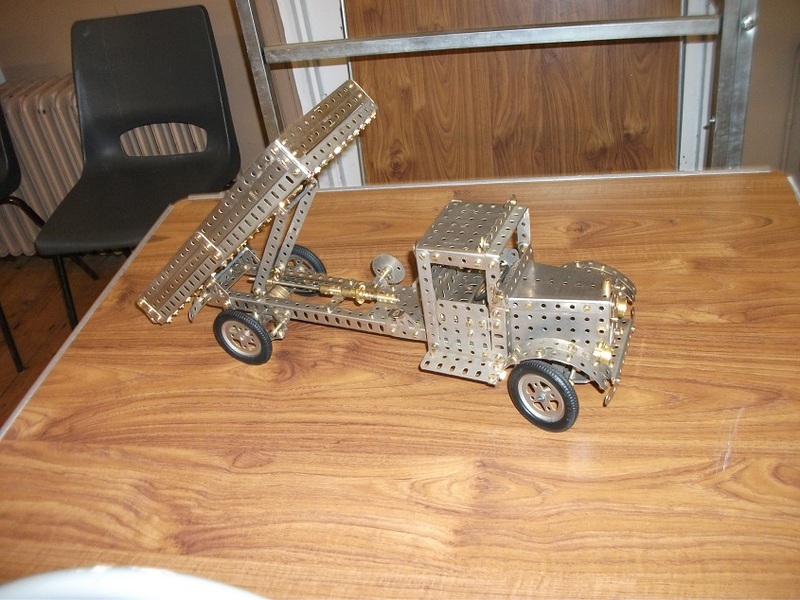 Neil also showed a simple windmill, built for a recent challenge at the Runnymede Meccano Guild which demanded the use of no more than thirty parts (excluding nuts and bolts). 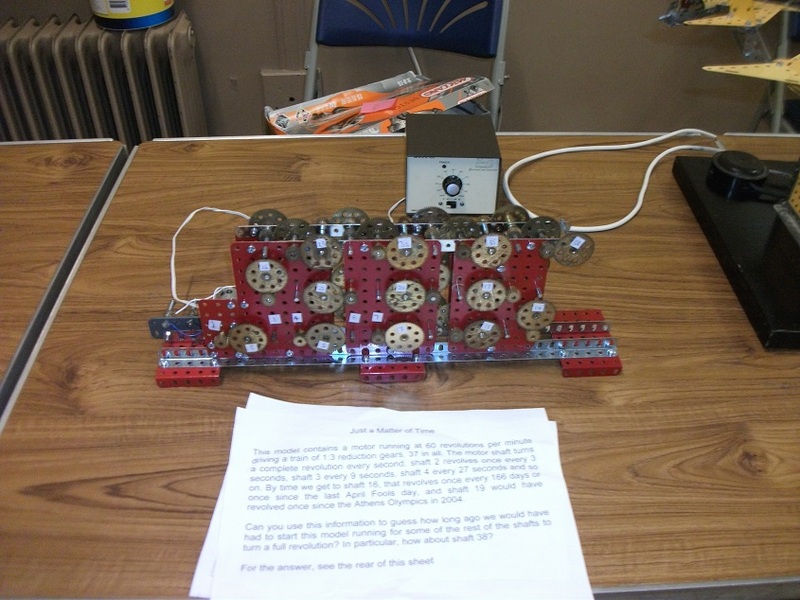 Club Webmaster Philip Drew has built a fascinating display model called ‘Just a matter of time’ featuring 37 pairs of gears, each giving a 3:1 ratio. The drive motor turns at 60rpm and each of the 38 axles therefore turns three times slower than the one before it. The effect of this cumulative reduction escalates very rapidly indeed and Philip displayed the mechanism with some approximate dates which relate to the speed of rotation. For example, If the mechanism had been switched on 3 months ago then shaft 15 would have just completed one full revolution, shaft 22 would have turned since the great fire of London and the final shaft 38 would have needed to begin turning around the time of the Big Bang to complete one revolution now! Philip is a master of exhibition models and his hope is that this one will get parents and their children chatting – it certainly made me stop and think. Giving large models a breather, Club Treasurer Pete Evans showed us a charming range of smaller models. The first was a 1970’s shop display model, built at the Meccano factory at Binns Road and featuring a number of jet planes in YBZ parts, rotating around a central pylon. These display models are very collectable. Pete has an enviable Blue/Gold collection and has been building models from the set instruction manuals including a fine lorry (set 8), a Roundabout (set 5), the Bluebird land-speed record car (set 6) and some smaller models from the remaining junior sets. Trying to think of ‘something different’ to build is an ongoing challenge and David Miller came up trumps with a railway system used by the Guiness factory in Ireland. This featured a narrow gauge system which carried ‘the black stuff’ from the factory and a novel gantry arrangement which then lifted the train (minus the narrow gauge loco which was uncoupled) clear of the ground before lowering it onto a unique standard gauge bogie. This bogie was unpowered but an engine in the narrow gauge train transmitted power downwards to drive the (now standard gauge) train away from the factory. David achieved all of this using multiple clockwork motors and we are all captivated by the whole thing. Dominic Hewitt boldly went where no Meccanoman has gone before, with a model of the USS Enterprise. This model was in fact not Meccano but a rival system known as Steeltec. It featured lights and a sound system and was a lot of fun. 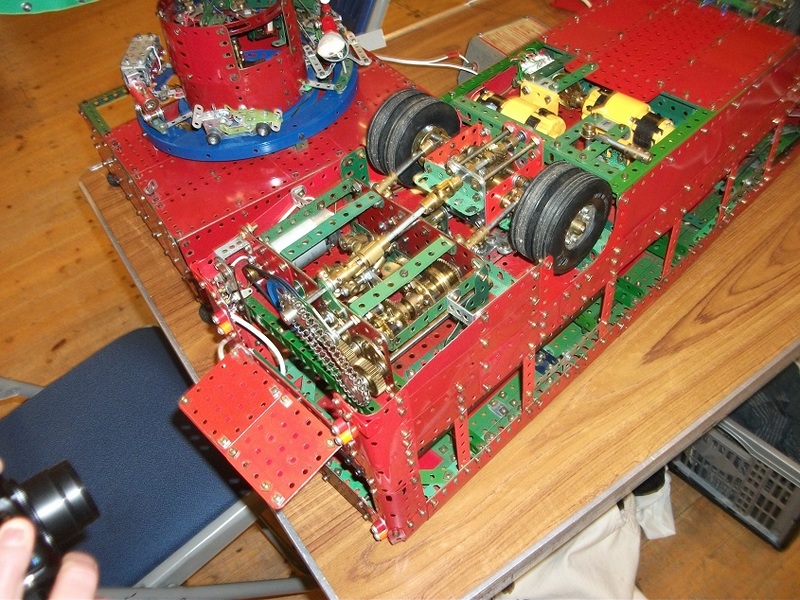 Sam Medworth had a radio-controlled Meccano articulated lorry, based on a set produced some years ago by Meccano France. Sam had built a large box trailer but suffered a problem with the drive to the lorry. I have heard tales of the nylon drive gear within this radio control unit stripping teeth and this could have been the problem, perhaps caused by the torquey tractor unit trying to pull away quickly with the additional weight of the trailer? We were delighted to have with us, three members of the Far South West Meccano Club which is our off-shoot branch, regularly meeting in Paignton. Club Leader David Worth came up for the afternoon with Philip Bond and Ian Jeeves. Philip Bond showed us some photographs and scale drawings for an AEC Regal bus which he is starting to build and also had a simple model of a chap pushing a barrow (or is it a rik-shaw?). The model is powered by a Magic Motor and showed that it is (just) possible to construct a walking man powered by this tiny clockwork motor. Even the youngest of these Magic Motors will now have a lot of miles on the clock and finding a strong one is becoming increasingly difficult. Rob Curling came along with wife Angie and showed the latest evolution of his Coles mobile crane in YBZ parts. This is a development of the model plan and based on a real-life version which Rob has taken photographs of. Rob has paid great attention to detail and I have no doubt that this one will be very popular once completed. 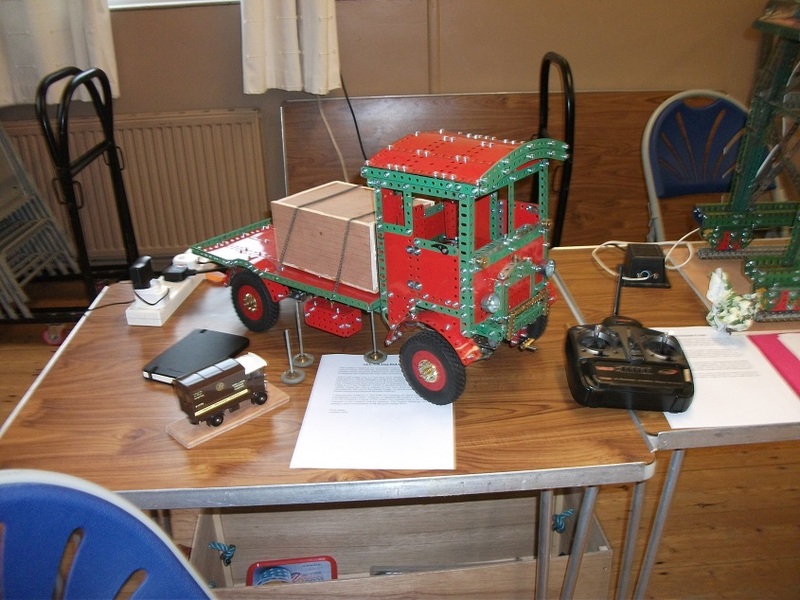 Club Secretary Richard Smith kept things simple this time with a lovely tipper lorry built in early nickel parts. The nature and age of the nickel-plated parts dictates that most have suffered quite badly and Richard explained how he has been putting the very best parts to one side for a project such as this. The model was finished using brass-plated nuts and bolts and the result was a real step back in time. Martin Arnold’s models continue to go from strength to strength with two smashing lorries in very clean YBZ parts. The first was a crane lorry based on the number 9 set Elevating Platform Vehicle (9.12) but with a crane of Martin’s own design. The second was entirely built from Martin’s imagination and was a large articulated low-loader. Both models were powered by modern motors and were very well presented. Chris Bates showed us his lovely AEC flat-bed lorry with working gearbox and pinion differential. This is built in red and green parts and is Chris’ first try with radio control. LED lights have been added since we last saw this one, powered by a separate battery in the cab, thus allowing easier removal of the cab from the chassis. 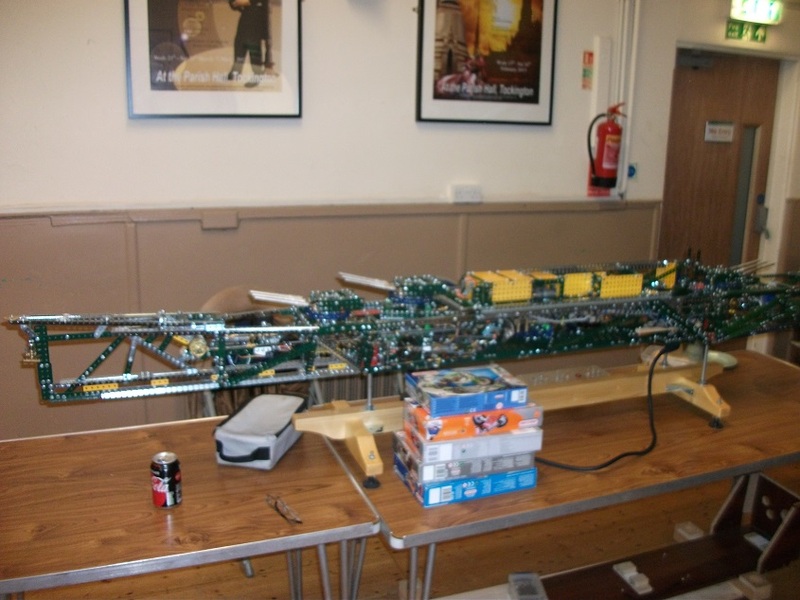 Chris is also building the Bristol dockside crane from the model plan and has the base completed up to the turntable. Two small but powerful motors drive the model along well and it even sounds like the real thing! John Day has bravely built a Congrave clock, operated by a ball bearing which runs along a channel, operating a tilt switch at each end of its run which briefly triggers a Meccano motor which tilts the ball run back in the opposite direction. This one was designed by John Wilding and the plan was published in Constructor Quarterly magazine No.73 (September 2006). Speaking as one to whom clocks remain a mystery, this was a fascinating model to watch. John also showed his carousel with 16 gallopers and (as always) this model ran without fault. John has left the roof covering off so that the mechanical workings can be enjoyed. David Northcott is known for building some very pretty scale model cars and his latest one is an early Bugatti type 13 racing car. David has the chassis and curved radiator grille just about finished and the Meccano six-speed motor really does get the rear wheels spinning. Andrew Jefferis brought along two models built in red and green parts (most colour schemes made an appearance at this meeting). The first was a little motor cycle and sidecar, powered by a Magic Motor which ran remarkably well on the smooth table top. 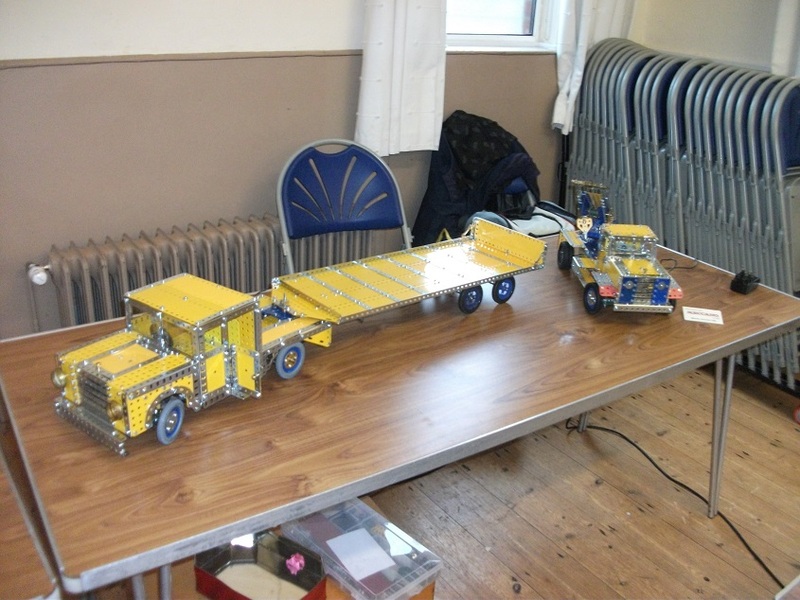 This model is taken from a Meccano Magazine article and used plastic road-wheels. Andrew also showed a very smart Observation Coach from the number nine manual (model 9.7) with a few modifications (as seems to be the norm when working from Meccano instructions). Steve Briancourt continues the labour of love which is the USS Missouri. We have watched this giant model slowly coming together and it is a terrific job. I would chance to say that Steve has probably finished the hardest part of the build, with endless small motors operating guns, anchors, props, rudders etc. Each of the three gun turrets is a work of art in its own right, with traverse, elevate, fire and recoil actions. The recoil operation is a very clever piece of design indeed and we especially liked the feature which Steve has incorporated, to fire all of the guns at once in a broadside! From the start, Steve has carefully calculated the weight, stress and strain on all parts of this model and has even been considering the displacement – would the finished model float, if suitably sealed against water ingress? – hmmm. Michael Edwards had a quite enchanting Christmas tree built (largely) from Meccano parts as well as his wonderful motor coach. This model has been around for many years but never fails to impress. The gearbox is automatic and operated by a centrifugal governor. In order that that is no neutral position (which would give a jerky operation) the model uses built-up ratchet mechanisms to enable two gears to be briefly selected at the same time – it is super-clever and I have never seen a better automatic gearbox built with Meccano. 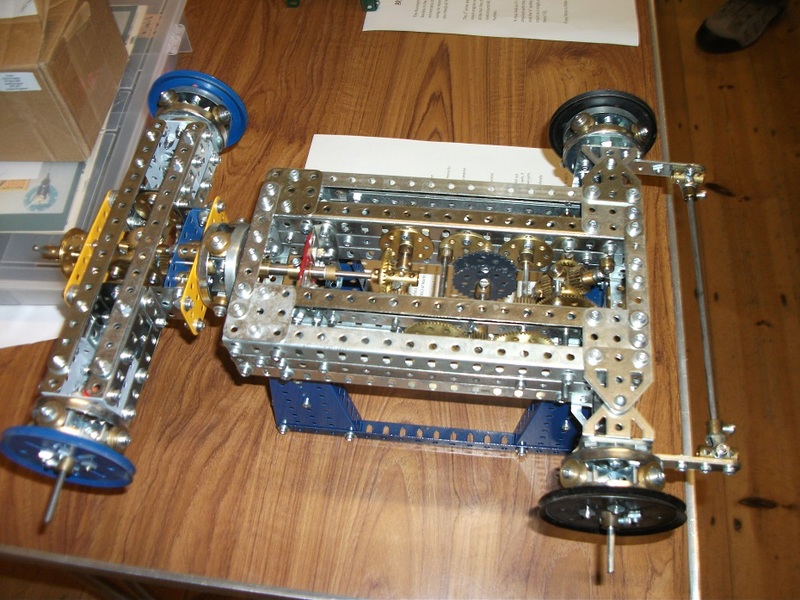 Last but not least, David Worth brought along a smart and futuristic radio controlled vehicle built with a modern set.